Are you planning your holidays? You have probably booked your accommodation, flights and travel and checked the passports, but what will you do with your fur buddy if he can’t come along to? 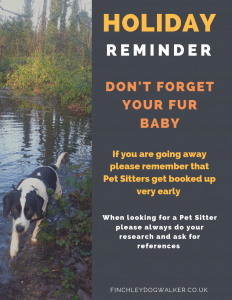 Pet sitters and boarders get booked up very early so please don’t leave it to the last minute before sorting out either a House/Pet Sitter or someone to Board and care for your beloved dog. Its certainly best if you can book well in advance, especially during school holidays and traditional holiday periods, when many facilities run at full capacity. Finding the perfect house/dog sitter can pose a problem, so ensure that you chose a reputable company that has lots of honest, positive reviews and references from satisfied clients. The best recommendations are passed by word of mouth, but always ask to see their licence and the appropriate insurance policies before making a booking. Visit the property where you will be leaving your four-legged friend and make sure it’s a caring, home-from-home environment. You really want to go on holiday and relax, happy in the knowledge that your pooch is being well taken care of, and of course, isn’t missing you too much! Some dogs just aren’t happy when placed in boarding kennels, no matter how fantastic they might be. Many pets are happier left in their own surroundings, which is where our pet sitting services can help. Your dog will have no stress and we can keep to his routine as closely as possible. We will take your dog for lots of walks, play games and have fun, while you relax, safe in the knowledge that not only your dog, but also your home is in very safe hands. Why is a pet sitter a better option than boarding kennels? Using a pet sitter can often work out a lot less expensive than boarding kennels and your dog is also less likely to pick up any bugs or infections than if he’s placed into a kennel with lots of other dogs. Your pooch will also receive dedicated one-to-one attention from his pet sitter, which he won’t have in a facility with many other dogs. You really need total peace of mind that your dog will be pampered, cared for and looked after, with no compromise. Knowing that your pet is happy and safe while you are enjoying your holiday is very important. The very last thing you need to be worrying about is your fur baby back at home. Organise your pet care as early as possible, to make the whole process less stressful all round.